“The IDF released the findings of its investigation into the incident on Sunday morning. According to the inquiry, Palestinian militants opened fire from the area of the school, shooting mortars and antitank missiles at Israeli forces. In response, the investigation reveals, the IDF decided to return fire with mortars. If readers are perhaps anticipating that this incident will prompt the BBC to reconsider its current policy of refraining from anything approaching robust reporting on the issue of the use of the local civilian population as human shields – which is precisely what a terrorist who fires anti-tank missiles at Israeli soldiers from the vicinity of a UN school is doing – then they may be in for some disappointment. That same ‘Newsday’ programme includes parts of Stephen Sackur’s recent interview with Khaled Masha’al. 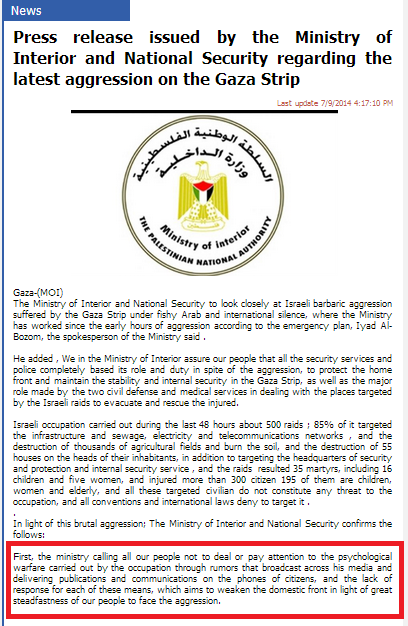 In addition, amplification is given to the following denial by Masha’al of Hamas’ use of human shields. We might well ask Emily Maitlis, her editors and numerous other BBC correspondents, editors and producers a very similar question. Here is the IDF video footage showing the empty school yard at the time of the errant mortar strike. 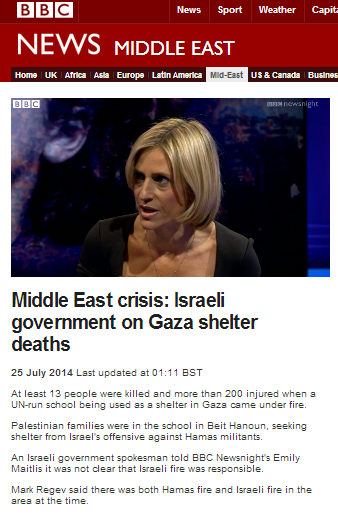 Lets nag the BBC to publish the Malcom Balen report. 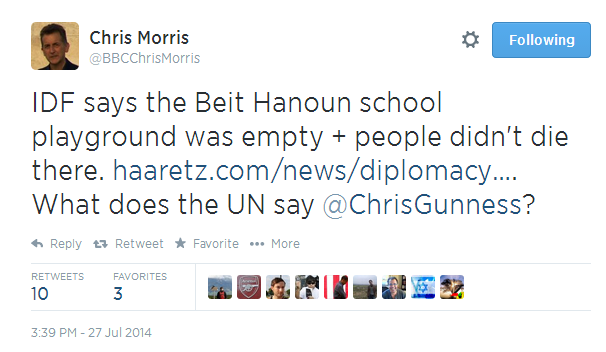 Beit Hanoun cannot tell us anything about something that hasn’t existed for decades. The BBC is now a franchise of the Stuermer. I believe a BBC so-called ‘Journalist’ has been reprimaded for saying that Western countries have been ‘bought by the Jews’. Anybody know this person’s name? Of course, in a sane country, with a government with a semblance of balls and morality and a law-abiding BBC, s/he would have been sacked instantly and prosecuted for antisemitic hate speech. “David Ward, the Liberal Democrat MP for Bradford East, was forced to apologise last week after saying he would “probably” fire rockets at Israel if he lived in Gaza. The row prompted a Muslim producer at the BBC to leap to Ward’s defence on Twitter with what appeared to be a reference to a conspiracy theory about wealthy Jews owning and controlling everything in the world. The producer, who has presented shows on the BBC Asian Network, including one devoted to Islamic music, refused to elaborate when repeatedly asked by other Twitter users to whom he was referring. Shaikh was forced to delete his account after The Sunday Times approached the BBC and could face further disciplinary action. The corporation said: “The BBC has clear social media guidelines which staff must adhere to, even when using personal accounts. You’ll need to do an awful lot of nagging – the BBC have already spent £300,000 to keep the Balen Report secret. Yes, that’s 300,000 quid of licence fee money used to hide the truth from the licence fee payers.